The DC9310 charges all DEWALT 7.2V - 18V NiCd, NiMH or Li-Ion batteries (except Univolt) in about 1 hour. It features the patented 3-stage charging system which provides maximum run-time and extends the overall life of the battery. A helpful LED indicator tells you the charging status (charged, charging, power line problem, replace pack, and battery too hot or too cold), as a three-stage charging system does its work. Minimize down-time with this fast and efficient charger from DEWALT! 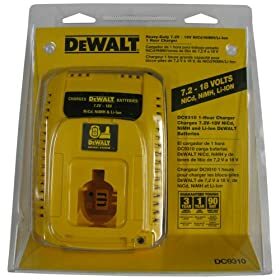 I have used this product for about a month now and I am impressed by the Performance and Design of this Dewalt battery charger. It's a plus that I can and do, now charge and maintain all my Dewalt and Black & Decker Pod Style batteries from 7.2 volt, all the way up to 18 volt. Which means I'll be able to up grade my cordless tools for a long time to come. Thanks.!!!!! I bought this to replace the factory charger I got with my 12-volt B&D Firestorm. I had purchased a DeWalt 12-volt battery to use with the Firestorm and found that it worked well. I figured the DeWalt charger would work on the B&D batteries as well as the DeWalt. 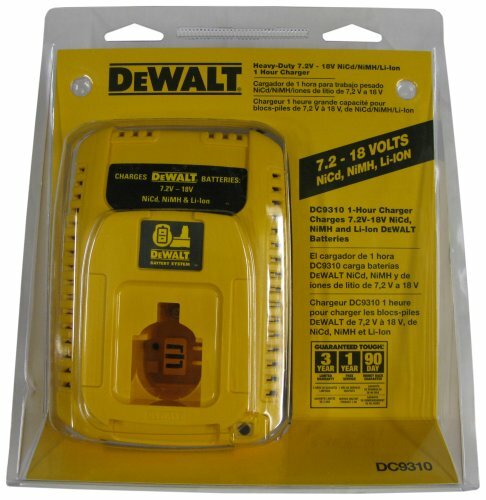 According to my research, this DeWalt charger would work with 12, 14.4 and 18 volt battery packs, providing flexibility in case I upgraded in the future. The charger has successfully re-charged both my 12-volt batteries. It did not want to charge the DeWalt... it was far more discharged than the B&D battery. But I removed and re-inserted the "dead" battery in the charger a couple of times and finally the charger accepted and recharged the battery. I am pleased with this unit so far. Received when expected. Was pleased with the price. Locally, it was much higher. It only took a few days to get it. Since I didn't need it in a hurry I'm glad I could wait and take advantage of the better price. I ordered this charger to charge my new 18V batteries as the original charger melted after not shutting off after only 4 months use. The charged charges a battery in 45 minutes, and it even charges my old 14.4 volt batteries, so I still use them and the old drill. This is a GREAT product!